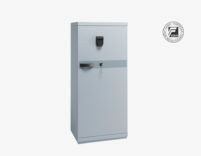 Armored safety cabinet with certification EN 14450: 2005 and ECB•S C10 The AS 16 armored safety cabinets are characterized by a composition of five elements assembled, plus the door. They are easily transportable and the installation is simple and it preserve, even if internally bolted, the same high resistance and guarantee of break-in safety, which characterize monobloc cabinets. 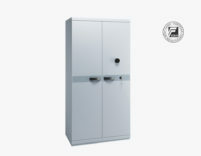 Armored safety cabinet with certification EN 14450: 2005 and ECB•S C10 The AS 18 cabinet is the line of modular cabinets made up of five elements assembled together with the doors. The AS 18 armored cabinet is easily transportable and is characterized by an extreme simplicity for installation. The AS 18 modular armored cabinets, even if internally bolted, maintain the same guarantee of safety and resistance to break-in that characterize the monoblock cabinets. 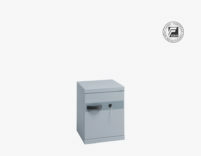 Armored security cabinet with certification EN 14450: 2005 and ECB•S C10 AS 20 Cabinet is the line of modular cabinets made up of five elements assembled together with the doors. The AS 20 armored cabinet is easily transportable and is characterized by extreme simplicity for installation. The AS 20 modular armored cabinets, even if internally bolted, maintain the same guarantee of safety and resistance to break-ins that characterize the monoblock cabinets. Armoured security cabinet To satisfy every kind of need, deeper cabinets (65.5 cm) have been created, capable of storing bulky objects. These cabinets are especially recommended for the custody of furs. The modularity of the SAC 160 modular safety cabinets does not affect the degree of safety because they are internally fitted with thick bolts that guarantee the same strength and resistance of the monoblock cabinets. 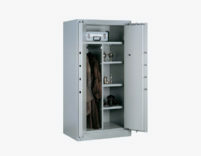 The SAC 160 cabinet is designed for floor anchoring. Armored security cabinet. To satisfy every kind of need, deeper cabinets (65.5 cm) have been created, capable of storing bulky objects. These cabinets are especially recommended for the custody of furs. The modularity of the SAC 200 modular safety cabinets does not affect the degree of safety, because they are internally fitted with thick bolts that guarantee the same strength and resistance of the monobloc cabinets. 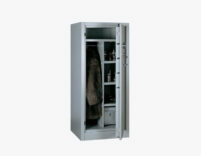 The SAC 200 cabinet is designed for floor anchoring. Monobloc armored cabinet with EN 14450 certification with safety class S1. The SM 65-50 cabinet is the smallest of the monobloc armored cabinets line and is made following the know-how and the technical and constructive experience gained over the years.